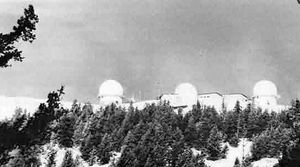 Kamloops Air Station (1957-1988) - A Cold War U.S. Air Force Radar Station first established in 1957 near Kamloops, British Columbia, Canada. Named Kamloops Air Force Station after the nearby city of Kamloops. Initially assigned a Permanent ID of SM-153 and later a Sage ID of C-153. 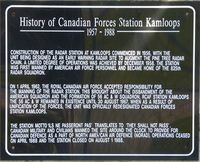 The site was turned over to the Royal Canadian Air Force (RCAF) on 1 Apr 1962 and operated first as RCAF Kamloops and then as CFS Kamloops. 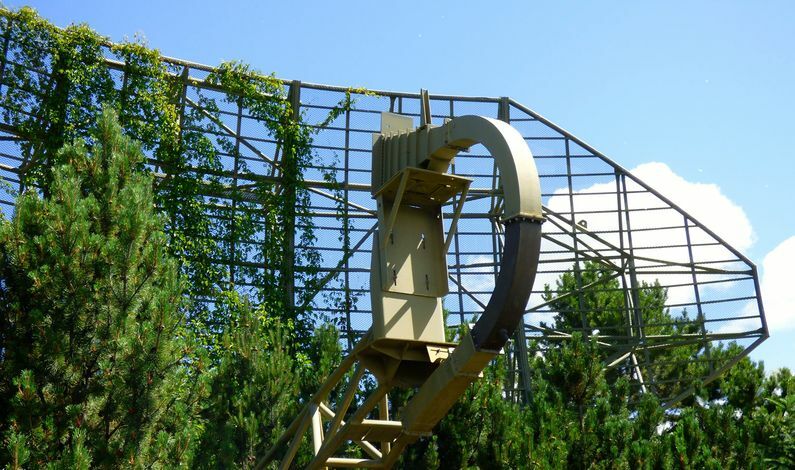 Abandoned in 1988. Part of the Pinetree Line radar chain and one of 21 stations designated to be turned over to the Government of Canada. Established in 1957 with the relocation of the 825th AC&W Squadron (US) to the newly constructed Kamloops Air Force Station. Initial equipment included the FPS-3A search radar and an FPS-6B height-finder radar. The radar equipment evolved into an FPS-20 upgraded to a FPS-87A search radar with an FPS-6B upgraded to a FPS-507 height-finder radar. The transition to the automated SAGE system began with completion of the SAGE Annex building on 18 Feb 1962 and the installation of the FST-2 starting 16 Mar 1962. Former Larson SAGE Direction Center DC-15, now a Commercial Data Center. On 1 April 1962, the RCAF accepted responsibility for the squadron with the 56 AC&W Squadron. The re-designation of the AC&W Squadron to a Radar Squadron the took place in 1963 and unit became CFS Kamloops in 1967. The site began operation as a SAGE site on 15 Mar 1960 initially feeding the Larson SAGE Direction Center DC-15 at Larson Air Force Base with manual radar data. On 1 May 1963 Kamloops became an automatic SAGE unit tied into the Larson SAGE Direction Center DC-15. On that same date the unit assumed maintenance responsibility for the FST-2. With the abrupt shutdown of DC-15 on 29 May 1963, control was switched to the McChord SAGE Direction Center DC-12 but under manual control until DC-12 was able to reconfigure. Manual operation continued until 4 Oct 1963 when DC-12 was able to complete all the SAGE links. After falling under TAC command in 1979, the SAGE System was realigned in 1982 and CFS Kamloops connected to the Malmstrom SAGE Direction Center DC-20 in Montana. The station maintained its connection to DC-20 until 1983 when the whole SAGE System shut down. CFS Kamloops was then connected into the North Bay ROCC in the Canadian NORAD Region, North Bay, Ontario, until it was closed in 1988. CFS Kamloops was deactivated on 1 Apr 1988 and the station was closed on 1 Aug 1988. At closure the base had 95 military personnel and 50 civilian support staff. The physical plant of the site was divided into the main site on top, a lower administrative area and a radio site. The upper site housed the operations building, the radar towers, a small chow hall and the backup generators. The lower site housed the headquarters, CE section, enlisted barracks, bachelor officer's quarters, orderly room, main chow hall, BX and motor pool. A small trailer park called McNair Park was established for married personnel and workers who had their own trailers. Other married personnel lived in Kamloops. A separate radio site housed the radio equipment for directing aircraft intercepts. Apr 1957 - Activated at McChord AFB, WA, as the 25th Air Division. Sep 1957 - Moved to Kamloops AS, BC, Canada. 15 Mar 1960 - Transferred to Spokane ADS. 1 Apr 1962 - Discontinued, site turned over to RCAF.. The military facilities site been almost entirely leveled, some commercial cell and radio facilities operate from the site near Kamloops, British Columbia. The FPS-20 search radar antenna sail and feed horn was moved to a city park in Kamloops as a memorial. Location: Mount Lolo near Kamloops, British Columbia. This page was last modified 21:52, 7 January 2019 by John Stanton. Based on work by Bill Thayer.